Reliable Controls is pleased to announce the official release of version 3 of RC-Archive® containing many new and exciting features to enable seamless data acquisition. 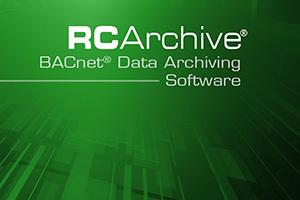 The new version of RC-Archive® adds archiving support for the following new objects: BACnet® Single-point and Multipoint Trend Logs, and BACnet® and Reliable Controls Protocol Runtime Logs. In fact, BACnet® is now a fully supported connection method, allowing discovery and data collection from any Reliable or third-party BACnet project using an IP network. For those who operate facilities that cannot accommodate the standard USB-Key (RC-Key) required to license RC-Archive®, a new soft license option may be purchased to authorize RC-Archive without a USB software key. At a user-specified day of the week, at a user-specified hour. Separate from scheduled database updates, RC-Archive® updates as often as is required to preserve data. BACnet® Trend Log archiving for both Multipoint and Single-point objects, and Runtime Log archiving, for both BACnet® and Reliable Controls® Protocol will allow archived data to be visually displayed in reports generated in the new RC-Reporter Energy Tracking and Analysis Software, the MACH-ProWeb™ user interface, and RC-Studio®.